We’ve written about Thiess and the Benandanti werewolves and werewolf witch trials before, but there’s more to the story. In the late 1600s, 1692 to be exact, in Jurgenburg, Livonia, a very old man of about 80 years old, named Thiess claimed to be a werewolf. Why would anyone in their right mind make such a claim in a time period of witch hunts, where those found to be serving the Devil would be burned at the stake or worse? 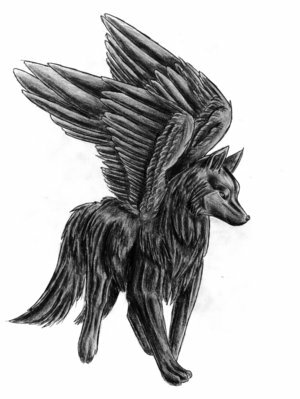 Thiess claimed that werewolves were not monsters or agents of the Devil, but rather they were benevolent creatures of God, who he called the “Hounds of God.” Their souls would ascend to Heaven when they died, and they were in the favor of God and worked tirelessly to defend the souls of the Earth with God’s blessing of the werewolf gift. The werewolves would bravely descend into the very depths of Hell to do battle with the demons and the witches, preventing them from escaping into this world to wreak havoc on the Earth. He claimed that when the Hounds of God failed to keep the witches and demons in Hell, that this was the cause for the bad crop seasons, and that when the werewolves succeeded, that was why the crops flourished when they did. If it were not for the Hounds of God, this world would be overrun with demons and witches who would cause all mortals to endure unspeakable sufferings. Werewolves were heroes! Of course, the judges were not exactly convinced. But what person with a beating heart would condemn an 80 year old man to be burned at the stake? The judges must have took pity on him for being out of his wits, for they let him off fairly easy and only sentenced him to ten lashes. Though we have written about kindly werewolves before, it’s really very few times that werewolves are painted as the good guys, heroes, even blessed by God. I love the phrase “Hounds of God” for the werewolves, as opposed to the hellhounds of lore, Cerberus of Greek myth, or the Hounds of Hel of Norse myth. Werewolves as guardians and protectors is definitely a new perspective.